Toward the end of last year, I was seriously considering selling MarketBeat and moving on to my next project. The company did not see much growth in 2016 and I thought I had grown the business as large as I could with my current skill set. The work had become mundane and I just wasn’t sure how I could keep growing the business in the future. The business was still very profitable and throwing off a lot of cash, but I just didn’t see a path to move forward. This led me to believe that it might be time to cash out and move on to the next project. I was seriously considering selling MarketBeat. I had listed the company with a reputable broker of online businesses, prepared a significant amount of documentation and financials for the company, had met with an accountant that could create an audited set of books for MarketBeat and lined up an attorney to represent me on the deal. From the beginning, I had told the broker that I would be willing to sell for a 4x multiple of annual earnings. There was some initial interest in the deal, which ultimately landed me two offers that were both for 3.1x annual earnings over the following 6 months. There was a private equity firm ready to do the deal at that valuation, but I declined because I just thought the company was worth more than that. A few months into the sales process, I went to a series of digital marketing and entrepreneurship conferences (Rhodium Weekend, The Capitalism Conference, Traffic and Conversion and Microconf). I came home with a bunch of new ideas that I could use to grow MarketBeat for the next several years. It turns out that the problem was not that I couldn’t grow the business, but that I needed to bring in some fresh, outside ideas to move the business forward. I also hired a very high-end digital marketing consultant to give me some growth ideas for MarketBeat (Dave Parkinson). The ideas that Dave brought to the table will generate at least $250,000 in new top-line revenue over the next 12 months. As I began to implement some of these ideas (like multi-page articles, new subscription pricing strategies, a Facebook messenger bot, etc. ), the work began to be fun again. I now had the opportunity to work on intellectually-stimulating and technically-challenging projects that were both enjoyable and would allow the business to continue to grow and evolve over time. I also identified some repetitive tasks that I really didn’t enjoy doing, such as processing payroll, day-to-day website management and scheduling ad placements in our newsletter and on our email list. I automated some of these tasks and brought on additional help to tackle the other tasks. This freed up my time to focus on aspects of MarketBeat that I really enjoyed, such as experimenting with new technologies and revenue-generation strategies. I am back to a place where I really enjoy working on MarketBeat. If I want to take a week off from MarketBeat and take a vacation or work on a different project, I can do that knowing that it will continue to hum along in my absence thanks to the systems and team that I have in place. While I’m not at the point where the business could run without me indefinitely, it is no longer a chore to run the company on a day-to-day basis. I can focus on the projects and growth initiatives that excite me the most, knowing that my team and my company’s business systems will effectively handle the day-to-day operations of my business. There are also some serious financial implications that come into play when selling a business that I hadn’t really considered when I entered the process. When you sell your company, you get a single massive liquidity event (one big check), but you also lose out on the monthly cashflow that your business generates. You have to invest the money that you receive from the sale to generate cash flow to live off of and the cash flow from your investments will be invariably much smaller than if you had just held on to your business. Most financial advisors recommend that you only withdraw 4% of your investment portfolio each year in a retirement scenario. If I sold the business at a 4x multiple of earnings and invested the profit after taxes, the amount of cashflow I receive from my investments would be about 16% of what I currently receive in profit from my business each year (Revenue * 4x multiple of earnings * .04 (withdrawal rate)). I would still receive a healthy amount of income from these investments, but that income would be substantially less than I receive in cash flow each year from MarketBeat. With this reduced cashflow stream, I would probably have to reduce how much charitable giving and angel investing I do each year and that is a trade-off that I am not willing to make. There are several other reasons that I’ve decided not to move forward with selling MarketBeat. First, there’s a huge amount of time, money and work that goes into selling a business. You must prepare a ton of documentation, get audited financials put together, create a ton of documentation for an ownership transition to take place, put together a legal agreement, etc. If I were to move forward with a buyer, it would take more work to sell MarketBeat and transition it to a new buyer than to just keep running the business. When you sell your company, you also lose a platform. As an entrepreneur that runs a very profitable online business, I have a level of credibility in the entrepreneurship space that other people don’t have. This allows me to speak about entrepreneurship with some authority and be involved in conversations that I otherwise would have no place in. If I sold my business, the insight and perspective that I have as someone actively running a business would start to diminish. I’d much rather be an entrepreneur– busy learning, experimenting, and sharing what I know– than the guy that used to own a successful business. You also have to find something new to do when selling your business. If I’m not going to run MarketBeat anymore, what would I do on a daily basis? Frankly, I didn’t have a great answer to that question. I probably would just go ahead and start over on another business, which means I would be starting from scratch. If I am just going to start another business, I had just as well keep the one I have now because I like the business model, I now enjoy doing the work and and I really like the people that I work with. Finally, if I were to sell MarketBeat, I would lose control over the business. Any sale agreement would probably require me to work for the acquiring company for at least a year before being able to move on to any new projects. I would effectively become an employee of the company I created and would have to follow the direction set out for the company by an acquirer—even if I vehemently disagreed with the direction they wanted to take it. At this point, selling MarketBeat is off the table. 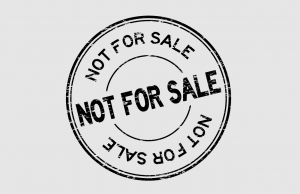 There are just too many downsides to seriously consider selling the business. The market does not appear to value MarketBeat at the same value that I do and I would genuinely miss owning MarketBeat if I were to sell it. Instead, I am now thinking about how I can build MarketBeat into a business that I can own forever. This means I am working toward building MarketBeat into a company that can sustain itself regardless of how much time and effort I personally put into it in any given week. I have been working to put into place key systems and people to run the day-to-day operations of the business, which allows me to work on only the projects that I want to work on. This also allows me to take a break from MarketBeat for a time if there’s another project that I want to pursue, such as writing a new book or launching a new side business. I do not believe the process of considering a sale was a total waste of time. It really made me think about what I like about running MarketBeat, what I don’t like about running MarketBeat, and what I want to do for the next five to ten years. For now, that’s building MarketBeat into the best business it can be.